Instructions: Card size is 6 x 6". Score and fold 12 x 6" white cardstock at 6" on the long side to create a 6 x 6" tent fold card base. 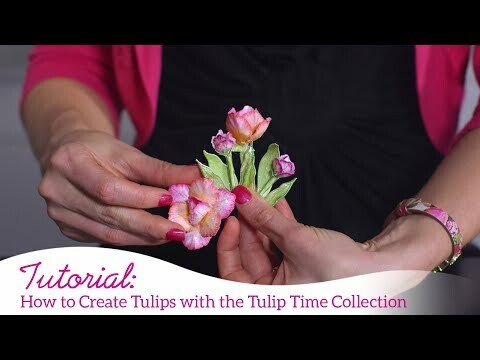 Cut magenta designer paper from the Tulip Time Collection to 5 3/4 x 5 3/4", cut green designer paper from the Tulip Time Collection to 5 1/2 x 5 1/2". Distress the edges of both and adhere together using dries clear adhesive. 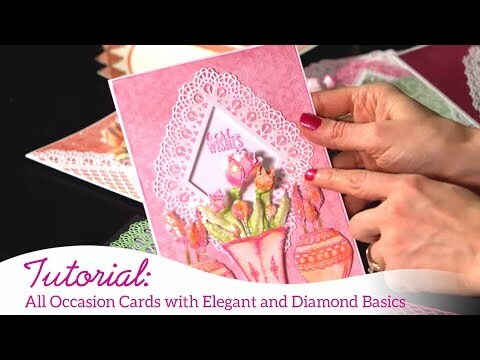 Adhere to the card base using dimensional tape. Cut another piece of the magenta designer paper 5 7/8 x 5 7/8", lightly distress the edges and adhere to the inside of the card. Diecut the Lacy Diamond die from the magenta designer pager and adhere to the center of the card front using dimensional dots. Using the third largest die from the Diamond Basics set, diecut the center of the Lacy Diamond die set from white cardstock. Sponge with dries clear adhesive, sprinkle with Rajni Chawla's Crystal Clear glitter, let dry and then adhere to the center of the magenta lacy diamond using Darice foam strips. Stamp the smallest leaves on floral paper using Ranger Olive ink, color using Leaf Green and Olive inks and diecut using the coordinating dies. Shape using the deluxe flower shaping kit. Adhere the flowers to the leaves, sponge with dries clear adhesive, sprinkle with Rajni Chawla's Crystal Clear glitter and then adhere to the card base using a hot glue gun.